I’m working on an update to the Practices and Techniques document I developed in 2008. While this has been a published document in my airline for several years, it was recently taken offline and is now a training background reference, as was the original intention for it’s development. Just one of the many subjects currently under revision is the section on Depressurisation Events – specifically the assessment of the Outflow Valve Position during an EICAS CABIN ALTITUDE or other related NNM’s that could lead to a Rapid Descent. There is a point during the  CABIN ALTITUDE event at which the crew are required to assess whether the Cabin Altitude is uncontrollable. This is typically done through the Duct Pressure and Pressurization System Indications popup, which should be on the lower EICAS if you have a pressurisation problem the EICAS can detect. 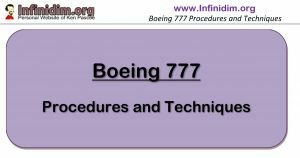 Before we go any further – note that the checklist specifically directs the crew to review the Cabin Altitude and Rate (of change) – and not the position of the two Outflow Valves. This is telling, and once again my suspicion is that a lot of thought went into their absence in the checklist. Cabin Altitude – an extremely high cabin altitude requires an immediate response (rapid descent) in order to take the aircraft down to breathable altitudes. For example – if the Cabin Altitude shows 25,000, it might be controllable (it’s probably not), but your immediate requirement is the safety of the passengers. Cabin Rate – a moderate rate of cabin altitude/climb might indicate a controllable situation. If your Cabin Altitude is 10,200 and the rate of climb 400 fpm – is it controllable? This leads us to the indications the checklist doesn’t discuss. Outflow Valves – in most respects, irrespective of whether the Cabin Altitude is 11K or 31k; whether the Cabin Rate of Climb is 400 fpm or 4000 fpm – if both Outflow Valves are closed, there’s not much you can do anyway. Both Outflow Valves Closed mean the pressurisation system is trying to control the cabin and has failed to do so. You’re unlikely to do any better. Duct Pressure – if you have duct pressure shown at this point (and the Outflow Valves are indeed closed) then that’s the complete equation. The lack of duct pressure could indicate no bleed source (engines/APU) and further investigation could lead to the recovery of pressurisation. Once again – you’re highly unlikely to be at this point without having the forewarning of other EICAS messages that should have assisted you in preventing the cabin altitude problem. Hence you wouldn’t be going into this cold. This doesn’t take long to do properly. But it does take longer to do than is typically afforded to it in the simulator when there’s a loud bang, a rushing noise, the EICAS  CABIN ALTITUDE alert sounds and crew race into the checklist memory items. During training we often see the PF commencing a rapid descent before the PM has completed an assessment. Remember – Slow Down, Enjoy the Emergency. If it’s for real, it’s likely to be the only one you’ll ever get – you may as well get it right. I’m not deliberately trying to over-complicate things here. For most of your career when there’s a loud bang and rush of air in the simulator and you look down at the EICAS and see indications such as are shown here – the subsequent Rapid Descent will be the correct response. It’s just that the real world occasionally offers some alternative scenarios that the checklist accommodates – but simulator scenarios usually don’t. 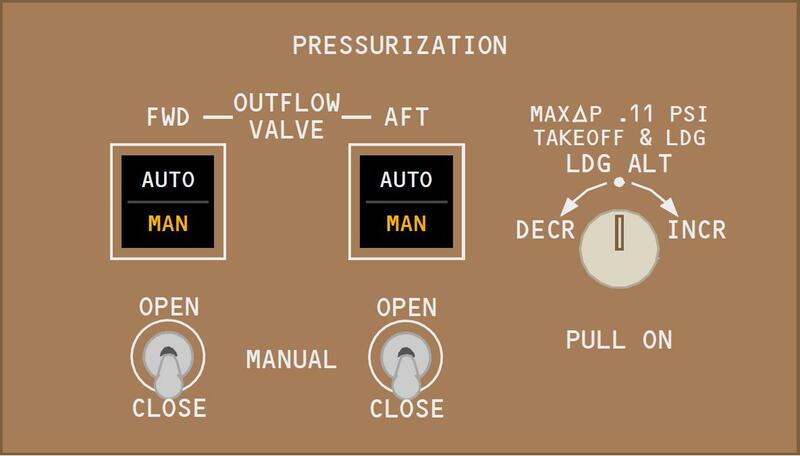 Based on this discussion – the question sometimes arises in regard to the manipulation of the Outflow Valves during the Cabin Altitude Checklist uncontrollable assessment phase. Having donned your mask and established communications – if you look down and (one or more of) the Outflow Valves are NOT closed, what do you do now? The obvious answer seems to be to close them – but let’s think for a minute. Firstly if the Outflow valves are not closed, and the Cabin Altitude/Rate is excessive – the Outflow Valve is not performing as expected/commanded, and you should see an associated EICAS message relating to either the Outflow Valve(s) (OUTFLOW VALVE AFT/FWD) or the Pressurisation Controllers (CABIN ALTITUDE AUTO). It is fully realistic to expect that one of these would have manifested prior to the CABIN ALTITUDE alert, and you may well have started the associated NNM checklist. Hence you would have some background to the failure, rather than being thrown into a sudden onset Cabin Altitude/Rapid Descent scenario. Remember again here that the priority is always the safety of your passengers (and yourself). The checklist directs you to assess cabin altitude and rate and determine controllability. As discussed – if the Cabin Altitude is high, and/or if the Cabin Rate is high – a Rapid Descent is the appropriate response. As soon as you’re established in a FLCH descent to MCP Altitude Selector 10,000 with the autopilot engaged – even if you black out, the aircraft will continue down to 10K and level off (speed brake out) and should be there for you to recover and fly. Usually fiddling with Outflow Valves as this point is NOT an appropriate reponse to what is usually a time critical NNM. Note : I said should see an EICAS message. There is in fact a scenario in our simulator where an Outflow Valve can be failed Open, without an associated EICAS message. The first indication of this will be the popup of the upper EICAS Pressurisation Display at 8400 ft of Cabin Altitude, followed shortly thereafter by the EICAS  CABIN ALTITUDE warning. Boeing have been consulted and this failure is indeed valid. To make matters worse – this valve failure is indeed controllable and a reversion to manual mode (without a checklist to instruct this) would recover Cabin Pressurisation. But let’s say you do have the scenario of one or both of the Outflow Valves not closed during the Cabin Altitude checklist memory items – Should you close it? All things being equal (that is, you haven’t been playing with the Outflow Valves or the Packs prior to this point) the answer to this is usually no. While there’s the possibility you might recover the cabin, your priority should be to commence the rapid descent and deploy passenger oxygen, rather than attempt to fault find a malfunctioning pressurisation system, without the guidance of a checklist. You’re unlikely to be able to recover the cabin prior to mask deployment, and at that point things are really getting serious. The safety of your passengers at this point (and before this point, and after this point …) are the priority. But … Never say Never. You might just be the guy who looks down at the EICAS on the day and sees 8500 feet on the popup display. You also take in quickly that the aft outflow valve is not fully closed and the forward valve is. You (correctly) identify that the problem is probably the AFT valve and the FWD valve is trying (and failing) to compensate. Without a checklist you reach up, go manual on the AFT outflow valve and close it. The Cabin Rate reduces and commences a descent, and the Cabin Altitude starts a return to normal operations. Congratulations, you’re prevented a Rapid Descent and your reward is you don’t get an overnight in Hawaii. One final note – if your Cabin Altitude is anywhere near your Aircraft Altitude (whether prior to or after commencing the Rapid Descent) – one or both Outflow Valves may well be open(ing) in order to reduce the risk of negative pressure differential. This is normal – do not mistake it for a malfunctioning Outflow Valve.